1 - Put the bacon and onion in a frying pan along with the garlic, oil and chilli pepper. 2 - Once the bacon starts to brown add a drop of white wine and simmer. 3 - Add tomatoes and cook for one hour on a low flame. 4 – Cook the Bucatini Fresh Pasta following label instruction, When done drain off the water and put the bucatini into a large bowl. 6 - Serve and ENJOY ! 1 - Bring a large pot (at least 12 quarts) of salted water to a boil. 2 - Add fresh pasta and cook according to package directions. 3- Drain pasta, reserving 2 cups of the cooking water. 4 - Return pasta and cooking water to the pot and place over low heat. 5 - Add remaining ingredients and stir until cheese and butter have melted and formed a creamy sauce, about 5 minutes. 6 - Season with salt, and serve with additional cheese if desired. 7 - Serve and ENJOY ! 1 - Heat the oil in a large saute pan . 2 - Add the chile pepper to taste., garlic and onion, and cook gently for 2-3 minutes. 3 - Add the tomatoes and let them cook until the sauce is quite thick, about 20 minutes. 4 - Cook the penne fresh pasta according to package directions. 5 -Drain the pasta, reserving about 1/4 cup of the cooking water. 6 - Once the sauce has thickened, add the red wine vinegar and salt and pepper to taste. 7 - Add the drained pasta and the reserved pasta water a little at a time to the sauce until you get the consistency you look and toss to coat. 8 - Serve and ENJOY ! Our fresh pasta has recently been added to the shelves of Whole Foods Market in the entire Florida region! We would like to give a very special thank you to Whole Foods Market and to all of the people involved in the support of local businesses. We never even dreamed we could have become a part of the natural movement in such an important company like Whole Foods Market. It is very important for every community to support local businesses which in turn supports their economy as well as that of the entire country's. Whole Foods Market is able to provide a superb quality and variety of goods to its customers making us feel part of a very important movement; Living green, Living well, Eating well, and much much more. THANK YOU WHOLE FOODS MARKET We are very proud to share all of the locations where Whole Foods Market has Peperonata Fresh Pasta for sale!! Mon - Sat: 8:00 a.m. to 10:00 p.m.
Sun: 9:00 a.m. to 9:00 p.m.
9:00 a.m. to 9:00 p.m. seven days a week. The amount of supermarket shelf space devoted to pasta is a good indication of its popularity with consumers. There is of course a split between dried and 'fresh' pasta but what is not so well known is that serious compromises have been made along the way, to achieve the price point and shelf life that the supermarket supply chain requires. Dried pasta is now a low cost commodity available by the box or sachet in supermarkets. Almost all dried pasta is made using an industrial process that is far removed from the ancient artisan method. The huge extruding machines use plastic dies, which have a longer life and generate less heat, so the pasta can be produced faster and with greater control. The serious downside of this is that the pasta is very smooth and slippery when cooked. The rough texture that is typical of extruding through bronze has disappeared, and with it one of the most important attributes of good pasta. In addition, industrial-speed drying of pasta at high temperatures reduces the nutritional value and can compromise taste. It is all a very long way from pasta drying slowly in open-windowed barns, using just the hot, dry southern Italian breeze. 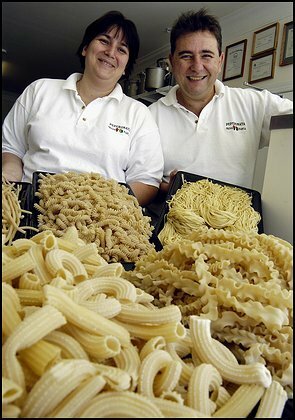 What the supermarkets call fresh pasta is neither truly fresh nor of the quality that is available fresh in Italy every day in pasta shops and bakeries. The supermarkets are able to call their pasta 'fresh' because it has not been dried. It could not be called 'freshly made' because the pasta could actually be weeks old. The shelf life is extended by a combination of processes including heat-treatment and packing in a modified atmosphere. It is often made with a reduced egg content, can contain preservatives and the heat-treatment changes the texture and the taste, gelatinising the pasta. 1- Boil the pasta in water slightly salted for 6 minutes, always counting from the second reboil. 2- Cut the pancetta in thin stripes, in a hot saucepan cook till crisp and light brown. 3- Whip the eggs, heavy cream, salt & pepper. 4- Add the pasta previously cooked and drained to the pancetta and finally the egg mixture. Turn off the heat and stir with a wooden spoon until eggs are cooked. 5- Serve and ENJOY ! This Saturday in Sarasota Downtown Farmer Market we will bring EMPANADAS, Beef, Chicken and Spinach. Cutting Fresh Pasta Locally in Sarasota Florida. Come visit us at the Farmers Market Saturday (Downtown Sarasota) Sunday (Siesta Key). Video of ravioli machine. Fresh Ravioli in Sarasota Florida. Get this Ravioli at the Farmers Market (Sarasota Saturday and Siesta Key Sunday) or at our factory. Click here for directions. We were featured in the past volume of the dinigplus publication from the Herald-Tribune. It is very important for us to mention our web designer and Search Engine Customization Gabriel from Destiny Technologies http://www.destiny-soft.com/ who made possible our fantastic web site and I like to mention that many customers mention the excellent web page we have and how easy is to navigate, how complete an fully loaded with useful information it is. Destiny Technologies http://www.destiny-soft.com/ put our name in the internet and we know how important for a business is to be there but most important is to be found and we are and the best of the best look with the new baby girl Gianna born August 3 2009.